You can find my work at the Vancouver Art Gallery Art Rentals and Sales program or visit my studio, located in North Vancouver and open by appointment. This class was exactly what I was looking for. 26 weeks of trying new media and techniques. I especially liked that you could do the lessons at your own pace and pretty much decide for yourself what your subject would be. The feedback from the teacher was very valuable and that, combined with trying all the different things, made this a very, very good class. Après avoir suivi avec plaisir le cours « Painting flowers from imagination in mixed media » je viens de terminer « 26 weeks of Inspiration and Training » et j’en ai été également extrêmement satisfaite. 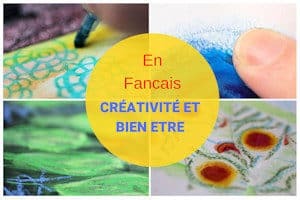 Les 26 projets proposés sont motivants et bien détaillés. Sandrine propose plusieurs pistes de recherche et chacun peut y trouver son compte, de l’artiste chevronné au parfait débutant. Elle fournit de nombreuses illustrations visuelles en photos ou vidéos. Les médiums proposés sont variés ainsi que les techniques dont certaines sont étonnantes ! 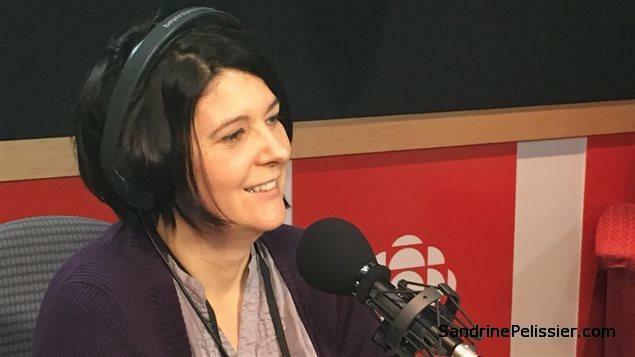 En outre, Sandrine propose, sans l’imposer, un commentaire critique, toujours bienveillant mais jamais complaisant et ceci offre vraiment un plus pour progresser. Je ne regrette pas mon investissement et je recommande vivement les cours de Sandrine. I’m really enjoying this class! I’m really enjoying this class! Because the assignments are quit brief, it forces you to think outside your comfort zone, and to try out new mediums and approaches. The instructions are clear and accesible, and I really like the feedback Sandrine gives, it’s very helpfull . 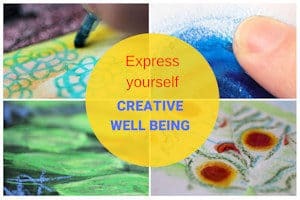 I really recommend this course to anyone wanting to explore new art forms! 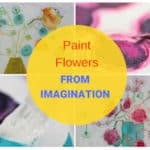 Painting Flowers from Imagination was a really fun course. The technique is very stress free. I did one painting and I thought it was way too dark and was going to gesso over it. 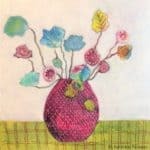 (Normal stressing) However, Sandrine tells you how to use pastels, watercolor or acrylic to work the painting and bring out color or change color and make it what you want. 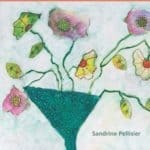 Sandrine takes you through the process step-by-step and I found all my questions answered as I went along in the course. I would recommend this to anyone from beginner to experienced painter. 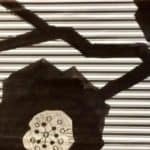 If you like to draw, the patterns are really fun to work out and to see how they transform your paintings. 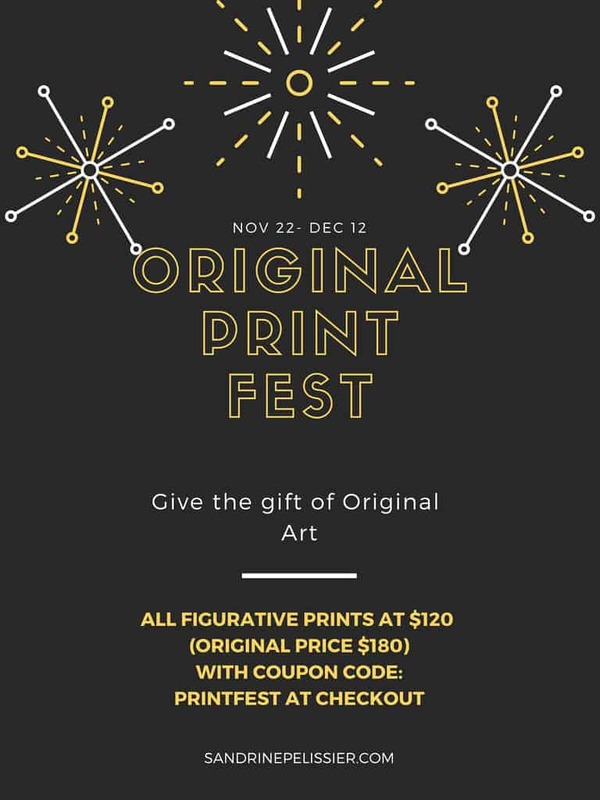 I am not a formally trained artist and was looking for a class that would give me a broad exposure to the things I might have learned had I gone to art school. This class fits the bill and is just what I was looking for. I have found the exercises, examples and tutorials so far to be excellent and I’m learning from them. The teacher’s insightful comments about my work, and the ability to see what others in the class are doing, are added bonuses. Just finished this online class. It is a very fun class and I learned a lot of techniques I would have not chosen to learn myself. The class opened me up to a variety of different approaches while guided by Sandrine. The description and supporting videos are clear and easy to follow. Sandrine’s feedback is very much to the point and is very kind. Now I feel ready to explore more and am ready to take the next steps. Would highly recommend this class to anybody who wants to improve. Thank you Sandrine, you are an inspiration for many of us!!! Love this course because it pushes me to create and think of different ways to do art. I need challenges. Sharing views and ideas with other artists is awesome. Sandrine is an excellent teacher and communicator. Very helpful and generous with her comments and her blog. She gives so many tips and explain so many of her techniques than it’s very easy for us to try and succeed sometimes. She gives us all the tools we need to achieve our goals. So far I am loving the class, it is challenging me in new directions, that I may not otherwise take. My art before this class has been, drawing, acrylic and a little watercolour. I have had to think for myself instead of copying other artists. Your critique is most valuable and I can immediately see the reason for your comment, so I must inherently know what I need to do to improve. I think the class is making me a better artist already. I am enjoying learning to use different media. Highly recommend Sandrines class to all. In this course it is both relaxing and thrilling to not have to preplan your artwork. Instead you get to play with paint for awhile and then discover the flower shapes you want to bring out. No pressure. No critic saying you can’t do this because you start out with no plan or expectation; just play. It is also great fun to find flowers that don’t have to resemble any from nature. You can’t really fail when you make up a flower. I find it fun and freeing to paint this way, and the results are rewarding, too. J’ai beaucoup aimé ce cours. J’ai beaucoup aimé ce cours.Cela a été une expérience à la fois relaxante et instructive.Ce qui m’a plu, c’est qu’il ne s’agit pas de reproduire quelque chose de figé mais plutôt d’avoir des informations sur le “comment faire” tout en étant libre de sa propre interprétation.D’ailleurs, en partageant sur Facebook avec les autres élèves, je me rends compte que, bien que les instructions données aient été les mêmes au départ pour tout le monde, tous les bouquets sont très différents au final.Ce qui signifie que la créativité de chacun n’a pas été bloquée par une simple copie.Tous les artistes, du débutant au plus avancé peuvent s’y retrouver et même aller plus loin et tout changer.Que demander de mieux ? J’ai d’ailleurs tellement aimé faire ces fleurs pleines de poésie et de liberté que j’ai continué avec Sandrine pour le “26 weeks”! J’étais un peu “bloquée” dans ma pratique et les cours de Sandrine m’apportent quelque chose de neuf et de joyeux. Being half way through this class I really enjoy all the projects very much. 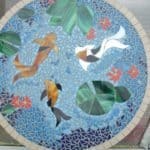 It helped me so far to learn to explore different approaches and inspires me to try out new art making. The projects are very well explained and anybody can follow and learn as well as improve as an artist. 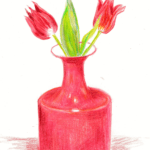 I welcome Sandrine’s feedback as it is very encouraging and gives me more ideas on how I can improve. Thank you Sandrine for creating this class!!! I have thoroughly enjoyed this class from Sandrine! 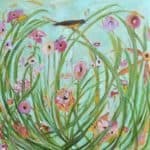 It has spurred on my intuitive paintings and I look forward to taking more online classes. Awesome tutorials and a Great teacher! After admiring Sandrine’s art for quite some time, constantly pinning her artwork and wishing I had talent like her! I took the plunge and and I’m so glad I did! Sandrine makes art fun and her techniques are very easy to follow. 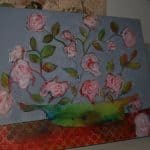 Before I knew it I was creating beautiful mixed media floral art! And for the first time I actually loved what I painted! Sandrine is not only very talented, she is also very kind and generous with her time. She’s quick to answer any questions you have and always does so with a sweet disposition. She gave me confidence in myself, which is priceless! 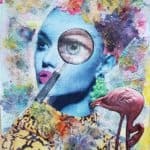 I learned so many techniques and I was exploring different mediums I’ve never heard of let alone used before! I’ve used some of the techniques I learned in this class on other types of art, not just florals. My eyes were opened up to so many different things by this one class. There are not enough words to explain how grateful I am to Sandrine, she put a little spark of light into my art and I’m forever thankful for her generosity. 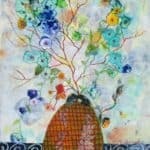 I can promise that anyone interested in watercolor or mixed media will love her style as well as the way she teaches. Sandrine Is A Great Teacher! 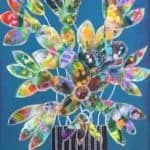 I loved Sandrine’s Imaginative Flower paintings the first time I saw them. 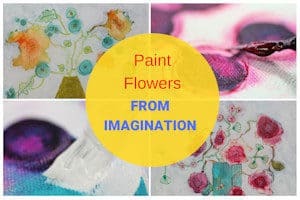 I signed up for her course and have successfully created several of my own Imaginative Flowers, thanks to her clear, concise explanations and video examples. I have purchased the 26 Weeks course and have not yet had time to start it, but I am looking so forward to it! Besides the fact that I really love Sandrine’s art and teaching, I really like and respect that she makes her courses available for a lifetime!! That has not been true of most online courses I have taken, but it’s definitely something I look for and seals the deal for me when I do. A great artist, a great teacher and material for life!! I couldn’t ask for more. I have included one of my paintings that I created following my Imaginative Painting course. 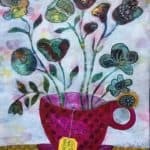 The Imaginative Florals have been among my very best selling paintings, too. Thank you, Sandrine, I appreciate you more than you know! I enjoyed this class immensely. I learned how to use materials I already had more effectively and in new, exciting ways. 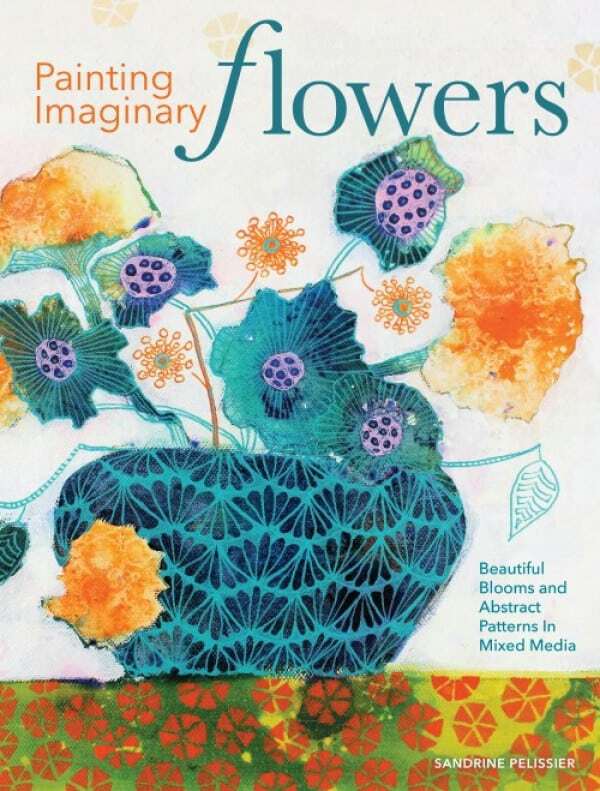 I especially liked the layering process…the building of design and “discovering” flowers, stems & leaves in the random mish-mash of shapes and colors. 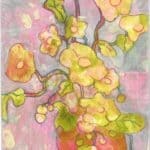 I highly recommend this class for those wanting to break out of the traditional floral-painting mode. LOVED THIS CLASS, made me realize how “tight” I get with a painting. Trying to relax and go with the flow, and cannot come close to these beautiful creations……will keep trying!!!! 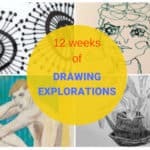 I’ve completed all 26 weeks and have learned a lot. Not only some techniques, but, basic approaches to planning works and critiquing my own work when completed. A big huge thank you for making 26 Weeks of Inspiration and Training available at a very affordable price. And, another huge load of thanks for taking the time to offer thoughtful and helpful critiques whenever requested. You have a gift for being both supportive and direct, and I’ve appreciated that. It took a bit longer than 26 weeks for me to complete all the projects, still, I’m sad it’s coming to an end. It has been a pleasure taking these classes. The weekly tasks are very interesting and Sandrine’s feedback on the works is always constructive and very motivating. 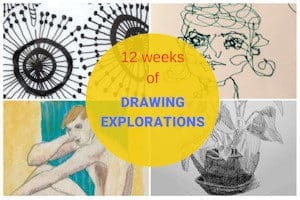 I guess these classes are important for both beginners and experienced artists, as you can learn and practice new techniques and find new ways for your work. I believe joining these classes has been of great importance for my art and I thank Sandrine for her guidance and kindness. It was a great voyage of discovery this 26 weeks class. The lessons, the tutorials were clear and to the point, as well as Sandrine’s feedback. The feedback gives so much added value. I went through all sorts of emotions during the assignments, but it pushed me in a certain direction. I can recommend everyone to follow this class of inspiration and training, because a lot is happening! I absolutely LOVE this way of painting! It opened up a whole new way for me to express myself. I wish I had more time to do more…but here’s one that came out of my endeavors while watching one of Sandrine’s online videos. I ended up purchasing a video because of it. It works like a personal coach. 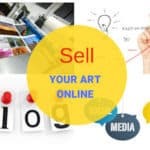 With the online classes “How to sell my art online” I am working on the tips Sandrine gives me. As I presumed it is a lot of work, but her classes are coaching me step by step to reach my goal. The result will be shown in my web shop to realise in 2018.
be able to update the site myself any time necessary. 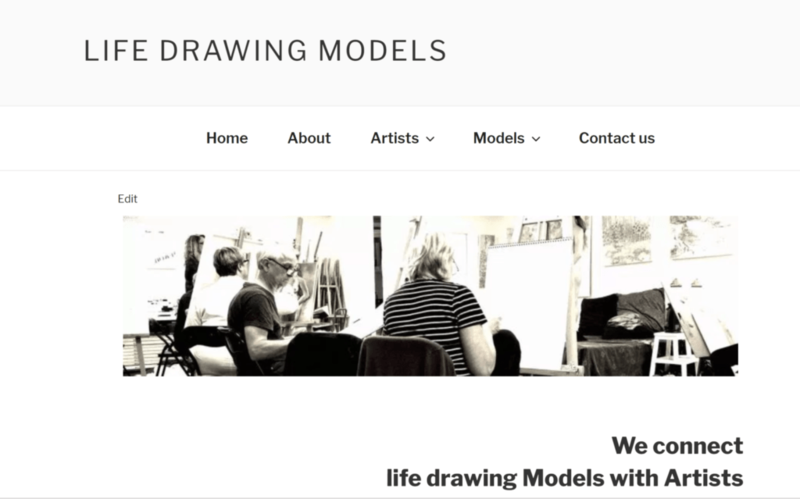 I joined Sandrine’s Figure drawing group in North Vancouver for a session last year after recovering from hand surgery, as well as after a 15 hiatus from drawing. Sandrine was welcoming and encouraging, and that helped me overcome my fear and anxiety about making art. I jumped in and entered pieces in the annual exhibition which was a first for me. I have continued on to explore in lots of different media over the last 18 months, and always get a boost when I get her newsletter! 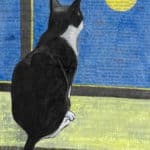 This class is exactly what I needed to jump start me back into drawing and painting after many years of working creatively on a computer only. The lessons flexibility and guidance are very helpful. Sandrine’s personal advice and helpful critiques have opened my eyes to another way of seeing. I feel a true sense of advancement in my skills and a widening of perceptive ability in my art. 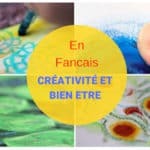 This is a great opportunity to try so many different techniques, with Sandrine’s gentle guidance and encouragement. I love this class..I have learned so much and I can see my artwork developing. I was so put off making art by an unsympathetic teacher in school, I just wish he had been like Sandrine! 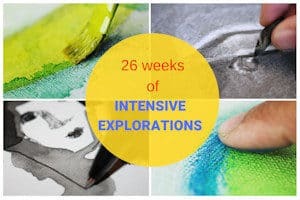 Now art is something I do every day…I feel I have set out on an exciting journey…I would recommend ’26 weeks ‘ unreservedly. Thank you for a very complete class, now I have to get started on my website ! What a fun and spontaneous way to paint! Loved learning some new techniques. Even though I have been creating and teaching art for so many years I always feel there is more to learn. Great instructions and inspiration! Thank you very much for your flower class. It was so good for me and I think my art work will be very different now because you showed me the artful process from start to finish. Your techniques are very honest and practical and more importantly… beautiful. I just bought your watercolour book from amazon so look forward to that. I wish i could do a class in person but I am in Australia…..so hopefully you will do more classes online. 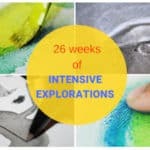 The 26-weeks-of-inspiration course was so much fun. Each unit brought me new enjoyment, and I learned so much. I tried many many types of painting and artwork, so many I would not have thought to do on my own. 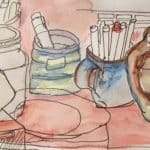 I recommend this course to anyone who is stuck in a rut with one type of medium, or who is timid and afraid to get started in the world of making art. This class has been a great experience. I have gotten to play with different styles, and moving outside my comfort zones. The class allows for setting your own pace which worked wonderfully for my job and other commitments. I have also gained new insight for the constructive comments from Sandrine. I look forward to finishing the assignments and maybe another class from Sandrine. 1 painting selected for AcrylicWorks 5: Bold Values! 2 paintings published in AcrylicWorks 4: Captivating Color​. “Fearless watercolor for beginners” is available in simplified Chinese. Four paintings published in Incite, the best of mixed media: Incite 4: Relax. Restore. Renew. Acrylic Works 2 book: Radical Breakthroughs from North Light Books. Splash 16, the best of Watercolor series. Incite 2, Color Passions: The Best of Mixed Media! Splash 15, the best of Watercolor series. Representing real women of all ages and shapes in art and celebrating their true beauty.